Yankees prospect Jorge Mateo has some serious wheels. In 96 games with Low-A Charleston, the Dominican-born shortstop stole an eye-popping 71 bases. He leads the South Atlantic League by more than 14 steals, despite the fact he was promoted to High-A a little over a week ago. Mateo’s posted gaudy stolen-base numbers in past years too. He swiped 11 bags in just 15 games in the Rookie-level Gulf Coast League last year. The year before that, he lead the Dominican Summer League with 49. If you hadn’t guessed it by his stolen-base totals, his speed grades out as an 80 on the 20-80 scale. Speed is clearly Mateo’s calling card, but he’s no slouch with the bat, either. The shortstop hit a respectable .268/.338/.378 in 96 games in the South Atlantic League, and has hit .464/.500/.714 in 30 plate appearances since his promotion to High-A, giving him a wRC+ of 116 on the year. Aside from his speed, though, he doesn’t really stand out from the crowd in any one area offensively. Over his stint in A-Ball, his walk and strikeout rates were both a stone’s throw from the Sally League average, while his isolated power was maybe a notch below. A good chunk of his production has came from his .338 BABIP, which certainly had something to do with his top-notch speed. Here’s a look at how Mateo graded out by each of these metrics in Low-A after regressing for sample size and centering to league average. 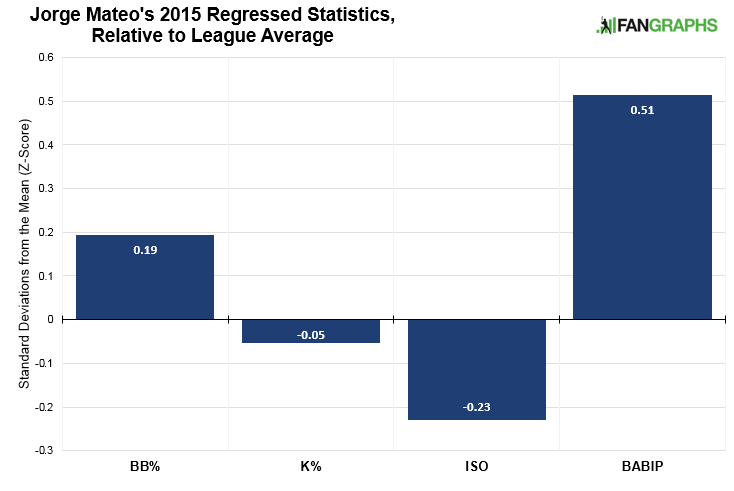 In case you were wondering, his stolen-base numbers put him close to five standard deviations above the mean. Of course, these numbers are based solely on the 2015 season, which has been just over 400 plate appearances for Mateo. But prior to this year, there’s very little data on the 20-year-old. Due to a wrist injury, he made it into just 11 games in the Gulf Coast League last year. And prior to 2014, he played exclusively in the Dominican Summer League, where the level of competition is laughably low. Mateo has little meaningful statistical data to his name. But there’s enough there to speculate on some possible futures for the 20-year-old. Running his 2015 numbers through the KATOH machine yields a forecast of 3.8 WAR through age 28 with a 74% chance of cracking the big leagues over that same period. This would have made him the 115th-highest-ranked prospect on KATOH’s preseason list. Not too shabby for a guy who’s still in A-Ball. How about some comps? What’s become of past players who posted outrageous stolen-base numbers and similar batting lines in Low-A? Using league-adjusted, regressed stats, along with age, I calculated the Mahalanobis Distance between Mateo’s performance and every Low-A season since 1990 in which a batter recorded at least 400 plate appearances. Below, you’ll find a list of historical players whose performances were nearest and dearest to Mateo’s, ranked from most to least similar. And here are a few who played primarily shortstop, as Mateo did. It’s not at all surprising to see Billy Hamilton’s name near the top. Hamilton grabbed all of our attentions in 2011, when he cleared the 100-steal mark in Low-A. Everth Cabrera, Mateo’s top comp, also performed similarly back in 2008, the season before the Padres snagged him in the Rule 5 draft. Cabrera’s and Hamilton’s seasons were the most similar to Mateo’s, but that’s not to say they’re all cut from the same cloth. In fact, there’s reason to think Mateo will hit for significantly more power than either Cabrera or Hamilton — and possibly anyone else listed above outside of Carlos Gomez. For one, Mateo hit for a tad more power in Low-A than the majority of his Mahalanobis comps, including nine of the top 12. But perhaps more importantly, Mateo has a decent amount of power that hasn’t yet shown up in games. Although his numbers may suggest it, Mateo isn’t nearly the punchless hitter that Hamilton is. Kiley McDaniel gave Mateo’s game power a future grade of 45+ in his preseason write-up, which blows away Hamilton’s 30 pop. Mateo’s not a power hitter by any means, but unlike many of his statistical comps, he should have no trouble clearing the Rexrode Threshold. On the defensive side of things, many think he’ll be able to stick at shortstop, which would obviously help his value. Kiley thinks he has the arm, range and hands to stick at the position, and just needs to refine his footwork and instincts. For what it’s worth, Baseball Prospectus’ minor league FRAA has him as roughly a scratch defender at shortstop this year. Mateo can do some pretty impressive things on a baseball diamond. But as with most speed-first hitters in the low minors, it’s a matter of whether he’ll hit enough to be worthy of a lineup spot. To Mateo’s credit, he’s more than held his own so far, but one could have said the same about the dozens of flops listed in the table above. Merely good hitters in the low minors don’t always make for productive big leaguers, even when their foot speed is off the charts. Still, while he’s a few years away from the show, Mateo’s upside is clear, which is why the Yankees were so hesitant to move him at the trade deadline. It’s still too soon to say with any certainty whether Mateo’s bat — particularly his power — will develop the way scouts expect it will. But if it does, and if he also manages to stick in the middle of the diamond on defense, he should make for a very valuable player. We hoped you liked reading Projecting Yankees’ Speedy A-Baller, Jorge Mateo by Chris Mitchell! i wonder if the yanks experience developing Brett Gardner will come into play, too often teams just instruct their speedy prospects to hit ground balls to “use their speed”, never giving them the chance to become more complete hitters. For one thing, this is a lot of hype surrounding someone with barely a year in A-ball. For another, Gardner has nothing to do with it. There’s no evidence that the two players have anything remotely to do with each other or that they were “insructed” to hit groundballs by the Yankees. Or that they were never “given the chance” to be more complete hitters, whatever that means. Gardner’s calling card through the minors was speed, yes, but after that, the comps between Gardner and Mateo end. Gardner was a proficient outfielder going into AA. His greatest attribute at the plate was actually his plate discipline, and that has greater translation to the Majors than power or average. Mateo’s bat-first prospect, with no plate discipline and no proficiency in fielding. Calling him a “Shortstop” at this point is being generous. There is, of course, an obvious and contemporary comp to Jorge Mateo that the author meaningfully decided not to mention; a former Yankees Shortstop prospect with “speed” and “power” and hailed for his defensive ability who was also a hyped prospect out of the Yankees organization. He also started his professional career at the same age as Mateo and even came from the Dominican Republic – in fact, they come from the exact same city. His name is Eduardo Nunez. If there was ever a comparison to make with Jorge Mateo, it’s with Nunez, from the “promising” power to the awful errors in the field at SS.I don’t care what “scouts” say, they also said Eduardo Nunez was “projected” to be an excellent Shortstop. “Excellent” in hype lingo often means “mediocre”. Hahah, that was a solid read. Seinfeld would be proud. Your post is complete idiocy. For one thing, Mateo does not have “zero discipline.” And neither Brett Gardner nor Eduardo Nunez were considered great prospects prospects. Gardner had zero pop and was criticized for puzzling routes in the OF. He was also 2 years older than Mateo when he was in High A. No point in even acknowledging the Nunez part. If you were being facetious, then my apologies. Nunez never stole anywhere near that many bases, and never walked 8.8 percent of the time, and I suspect this Mateo’s power is already better even with this little to go on as a sample. Lots of reasonably decent defenders make errors while they are young and in the low minors. The only thing a bit over-hyped about this is with all the good shortstops there are in the Sally league right now, he doesn’t stand out except for the steals, and may be a bit behind several of those guys.